Sometimes, when it is a shift night and the house is quiet, I feed the kids experimental dinner. Some are recipes I find on other blogs I want to try, some are recipes I am working on. I feed them spinach! I feed them beans! I use mustard! All items on Man’s blacklist. Some fall short, Pinterest flops or meals that still need serious tinkering, but sometimes, they are a hit. Tonight was one such hit. They were gone. Before Mom could grab seconds and take a picture GONE. It’s a new diet plan I’m trying out – the growing boys plan…I should be skinnier. The kids almost always want pizza, and I didn’t have any yeast on hand to make actual pizza. French bread pizza is always a winner, but Oh, my Carbs! I found this recipe from Lick the Bowl Good and this recipe from The Kitchen is My Playground. They looked almost identical, so I combined them and added a little of my own. I think if you trace them all the way back to the originator, it’s probably Rachael Ray. That girl is a foodie genius, which is why I know if we ever met, we would totally be friends. Call them pizza bites, pizza muffins, pizza puffs. Me, I will stick with pizza cupcakes. Call something a cupcake, and whomever is the guinea pig is always happier to try it. 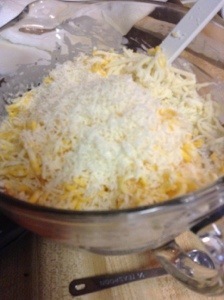 Whisk them together in a medium sized bowl. 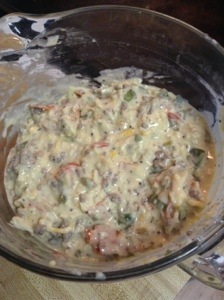 Mix in your “mix-ins” until combined and let the batter sit about ten minutes. Scoop into a greased or paper lined muffin tin. These don’t rise a lot, so fill them to the top. 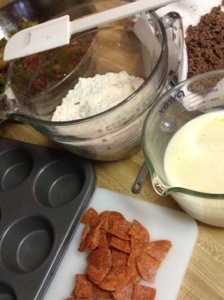 If you don’t have a silicone muffin tin, I would suggest using liners. Even greased, these did not exactly slide right out. More like stuck to the pan like glue. Use the liners; save yourself. For full size cupcakes, bake these at 375 for 20-35 minutes or until golden. The mini version will be closer to 15-20 minutes. We just want all the batter (including those eggs) in the middle set and cooked through. As for the physics, my kids’ favorite TV show is Mythbusters. Nothing like science and blowing stuff up to keep a boy’s attention. As a treat, about once a month, we eat dinner on shift night while a show they pick. It’s almost always Mythbusters. It’s almost always pizza. It’s almost always Thursday. I’m sure these would go great watching The Big Bang Theory too. What’s your favorite Thursday night dinner plan?